Vincent and Rich converse with Seth Mnookin, author of The Panic Virus, about vaccines, autism, thimerosal, and a contagion of human unreason run wild. 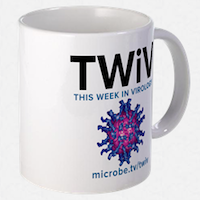 Click the arrow above to play, or right click to download TWiV #117 (69 MB .mp3, 96 minutes). Great interview. Glad you had the time to go into such detail with Mr. Mnookin. constrained as is mainstream media by the need for quick sound bites. because we believe that they are highly instructive. This was great; thank you so much! Love TWiV and enjoyed the broadcast but found this interview struggling around the issue of media integrity. Everyone tiptoed around the 800 lb gorilla in the room, that mainstream media is a for profit enterprise. Markets where consumers are also customers can sometimes focus on consumer needs but the media treats consumers as a product to be harvested and delivered to its customers, advertisers. Outlets that report a Wakefield story honestly are leaving profits on the table because they leave out the attention grabbing aspects of a controversy which yields a larger harvest.